Often, the charge total of an opportunity doesn’t represent how much profit you’re making. As well as the products you rent or sell and services you supply, a job might include additional costs or expenses that affect your total profit. Use Costs in Current RMS to log these against your opportunity to get a true breakdown of the total projected profit. Some costs are added to an opportunity automatically for you. To view and log costs, click the Costs view button at the top of the items list. You may also log manual costs. 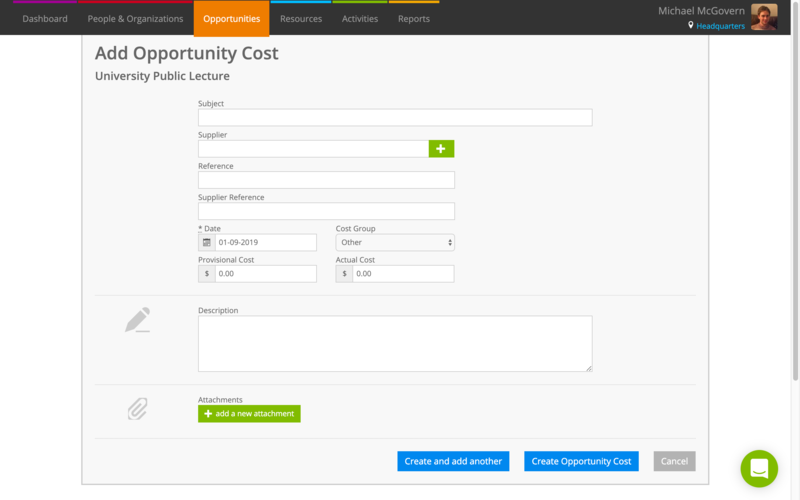 To log a new cost, click add a new opportunity cost at the bottom-right of the Costs view. Type a name or other descriptor for the cost you wish to record. This is required. Choose the organization or contact associated with this cost. This is generally the company or individual supplying a service to you or providing it. Current will auto-suggest from People & Organizations as you type. If you have a PO number, reservation number, or other reference, enter it here. Your supplier might have given you a reference, enter it here. Specify a date for this cost, i.e. when the cost was or will be incurred. Enter any further details of this cost in the description field. Store files related to this cost, such as receipts or order confirmations, by adding an attachment from your device. Cost groups are a way of categorizing your costs. Choose a cost group from the drop-down menu. Create new cost groups in System Setup. 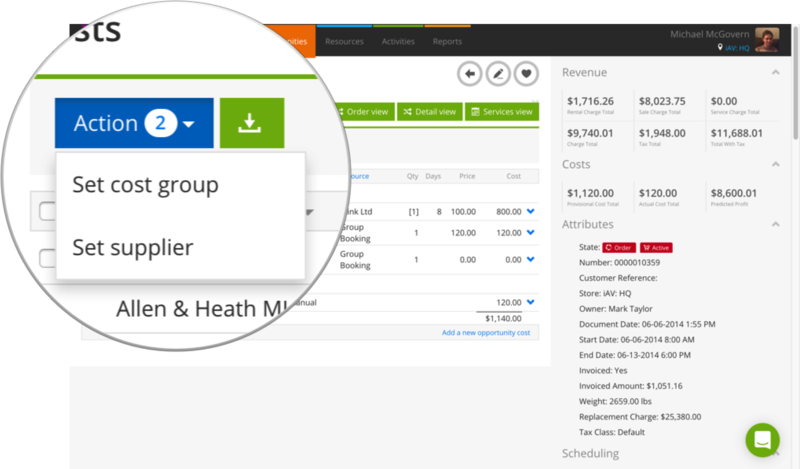 The groups you select here are displayed on the Revenue and Costs Summary screen, so you can get a detailed overview of opportunity expenses. 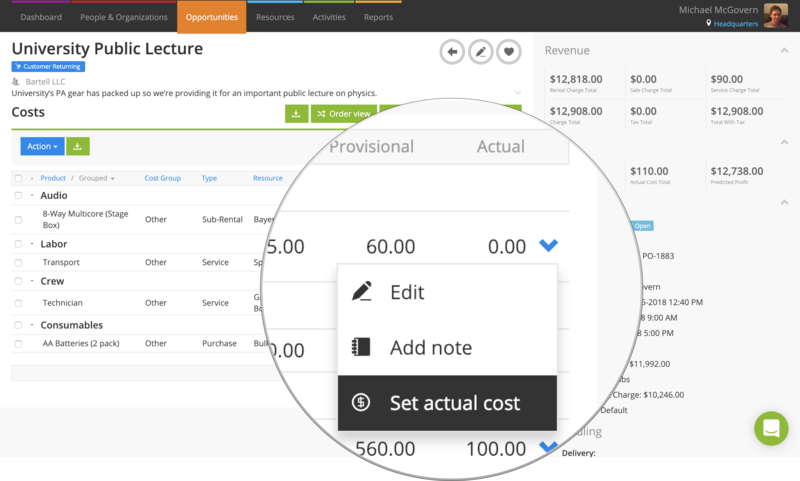 Manual costs can be edited at any point, so you can add a provisional cost now and enter an actual cost when you know the final figure. For example, if you’re putting together a draft order for a gig, you might add an estimation for hotel accommodation initially. Later, you might get a receipt from the hotel and enter the actual cost. When you're done, hit the blue Create opportunity cost button to add it. On the costs view, click the “Provisional Cost,” “Actual Cost,” or “Price” column to change your costs. For automatic costs, the cost is a calculation based on the quantity, price, days, and rate definition. The provisional cost cannot be changed, but you can click to change the price or days. For manual costs, you may change the provisional cost or actual cost. Click the blue arrow to the right of a cost and choose Edit to make further changes. 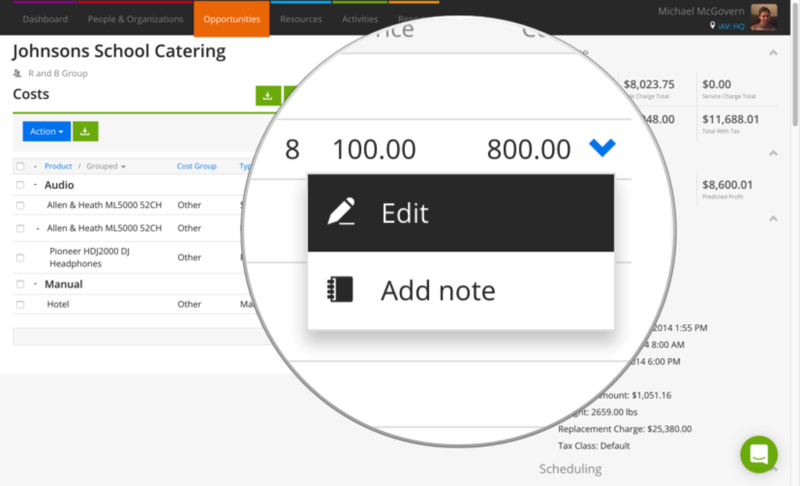 For automatic costs, you’ll see the opportunity item edit screen. The fields are the same as when creating or editing an opportunity item. 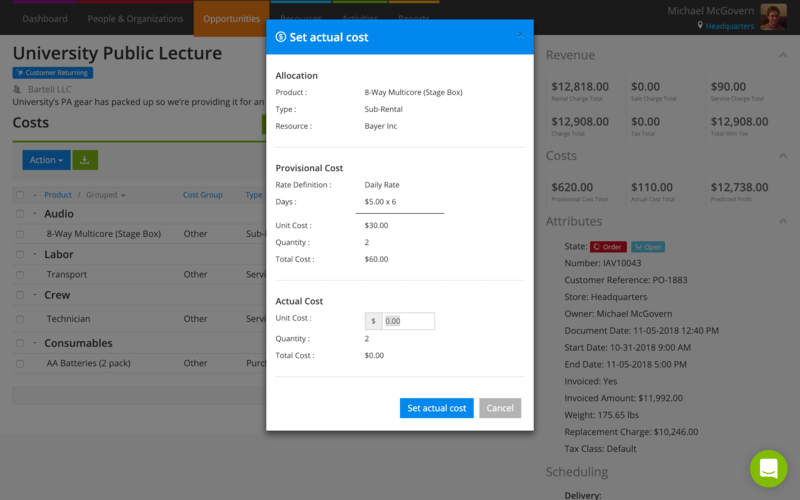 For manual costs, you’ll see the opportunity cost edit screen. The fields are the same as above. Add notes using the Add notes from the drop-down menu. Tick boxes in the list and use the Set Cost Group or Set Supplier options to set or change the cost group or supplier on all ticked items. Automatic costs for sub-rentals, sub-contract bookings, group bookings, and external bookable resources are added as provisional costs. If you’ve received an invoice from your supplier and the cost is different, set an actual cost. To add an actual cost, click the blue arrow next to a cost and choose Set actual cost from the menu. On the pop-up that appears, enter a unit cost that’s used to calculate the actual cost by multiplying it by the quantity. 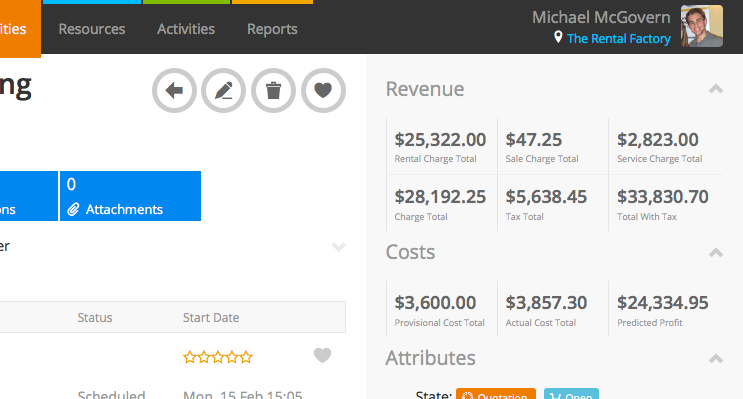 Total provisional and actual costs are displayed at the top-right of your opportunity underneath the revenue section. Current will calculate total predicted profit for you by taking the total of any costs from the charge total. Actual costs are used where specified, otherwise, otherwise provisional costs are used. Why can’t I see any automatic costs against my opportunity? Automatic costs are added to orders, reserved quotations, and provisional quotations only. Why was a particular cost added to my opportunity automatically? The price isn’t correct. Costs are automatically added for sub-rentals, sub-contract services, bookable resource allocations, and sale items. You can set costs in a variety of places in Current RMS; if you’re not sure why a particular cost was added, check out: How are automatic costs added to an opportunity? How do I report on my costs? 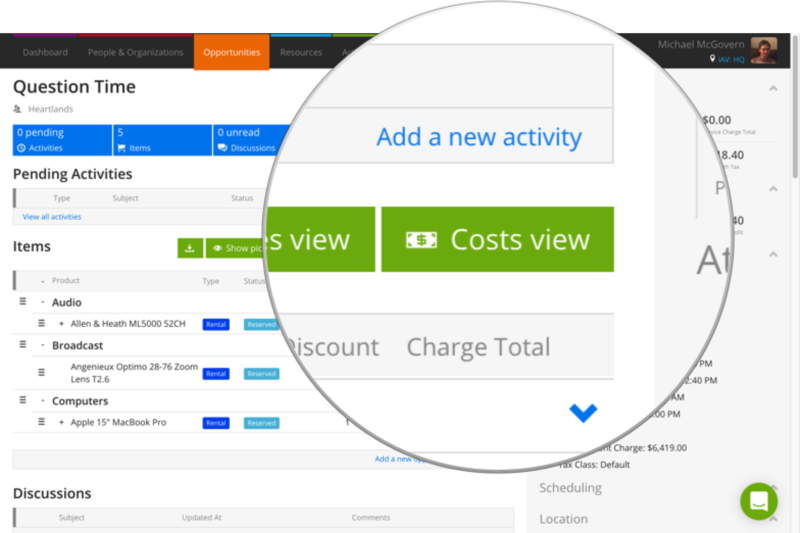 The Opportunity Costs report under Reports shows all cost transactions for your orders. Custom views would also work great for this! Provisional Cost Total, Actual Cost Total, and Predicted Cost Total are available as attributes when creating custom views. Export your data to CSV and open in Excel or Numbers to manipulate the data further. I'm confused about my predicted profit. The figures don't add up.